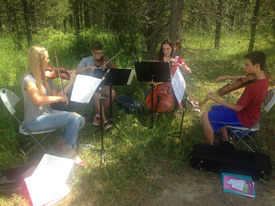 Even though the musical focus of Mountains & Strings is chamber music, the participants have plenty of opportunities to play solos, fiddle, and develop their orchestral skills. Most of the chamber music studied during the week is string quartet music from all the major composers from Beethoven to Shostakovich. Participants also receive professional training in chamber orchestral studies. 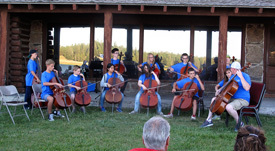 They rise to the challenge of learning and performing professional level music in only five rehearsals. 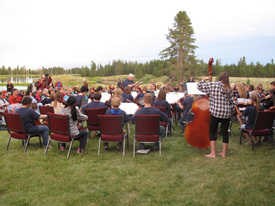 The Friday evening concert is dedicated to fiddling and other fun music. 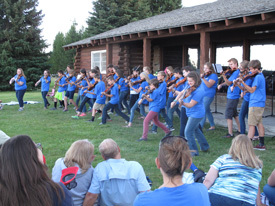 Some of the folk styles studied and performed at Mountains & Strings include old-time, jazz and celtic fiddling. The famous Mountains & Strings Cello Choir also performs at this concert, bringing down the house with a variety of music.